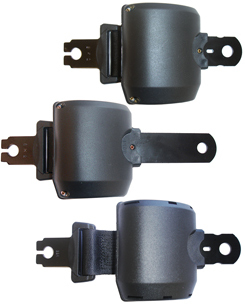 Emergency Locking Retractors (ELRs) which lock in an emergency. a) Webbing sensors which sense webbing acceleration. i.e. the retractor will lock if the webbing is snatched. Typically abrupt torso movement. b) Vehicle sensors which sense vehicle movement. i.e. the retractor will lock with sudden vehicle movement. Typically abrupt stopping, vibration or roll-over. Vehicle sensors require specific installation angles i.e. 90°/90°. "A retractor which during normal driving conditions does not restrict the freedom of movement by the wearer of the safety-belt. Such a device has length adjusting components which automatically adjust the strap to the wearer and a locking mechanism actuated in an emergency." 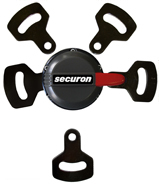 Automatic Locking Retractors (ALRs) which lock when the lap belt is put around the wearer. "A retractor allowing extraction of the strap to the desired length and which, when the buckle is fastened, automatically adjusts the strap to the wearer. Further extraction of the strap is prevented without voluntary intervention by the wearer." - Push Button or Turn Lever. - Webbing, Cable, Metal Tang connections. - Integral IP67 Rated Micro-switch with lead length/connector options. 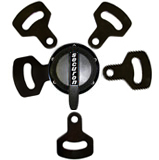 On Twin, Single & Turn Lever buckles. "A quick release device enabling the wearer to be held by the belt." 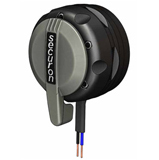 All Buckles and Retractors are incorporated in a range of systems certified to one or more of the following standards: ECE R16, SAE J386, SAEJ2292 and ISO 6683. Black / orange webbing as standard options. Not all variants shown are available in quantities less than 200.